Tools of the trade. What can I say?...I love a new brush and I love an old one. Click here for a signed archival print of this painting. Very nice! I love how you captured the character and contrast of the brushes. such a simple subject ans so well done Don. 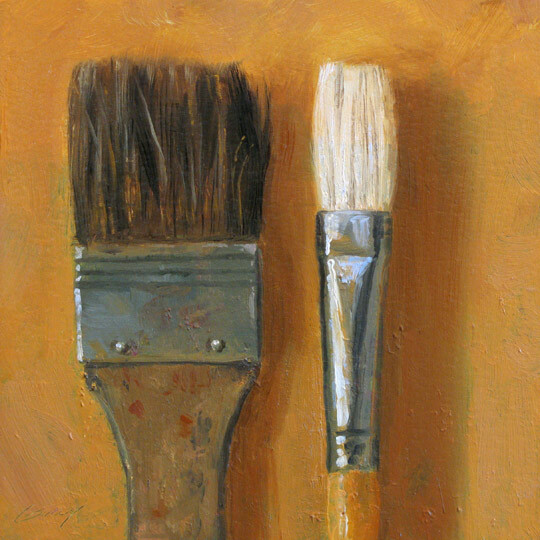 brushes have a special beauty, smell, and feel... i can understand why you felt the urge to paint the tools of the trade:) btw, love the horse in the previous post! Thank you, Pam. Welcome to my blog! Others may tire of looking, but I never tire of painting my brushes. Thanks, Rahina. Hi Rosa--a big thank you for featuring my painting on your blog, I'm very honored.